Article taken from this Magazine. While the hospital facilities could be compared to those from the 19th century, since there were usually no electrical generators, X-ray machines, electrocardiographs or means for refrigerating blood, the doctors did have 20th-century knowledge of antibiotics, and they did follow aseptic techniques. Although they lacked modem equipment and facilities, VC doctors made the best of the situation with sophisticated and attentive care of their patients. Among the founding members of the VC were Dr. Phung Van Chung, who had received his medical education at Hanoi University, and Dr. Ho Thu, a French-trained phannacist. In January 1963, Radio Liberation announced the formation of the Military and Civilian Medical Council headed by Dr. Chung to "strengthen and develop military and civil medical activities, to meet the medical requirements in the ever-broadening areas freed from U.S.-Diem control." Six months later, the Medical Liberation Association, also known as the Liberation Doctors Association, was established to provide a pool of doctors to support the VC. However, finding qualified doctors was difficult. In 1965, for a population of 12 million citizens, South Vietnam had only 800 medical doctors, of whom 500 were serving in the ARVN, 150 were in private practice in Saigon and 150 practiced in the remainder of the country. The VC had to train its own medical people. The course to become a nurse took six months, and the course to become an assistant physician lasted 18 months. Vo Hoang Le, an assistant physician, gave the following description of his training: "I learned from doctors, from friends and from books. For example, I had a friend who was an expert on abdomens, and I.. .practiced with him. Our school was everywherein the tunnels, beside a patients bed." A nurse described the six-month training course that was taught by an assistant physician, two nurses and a midwife as follows: "The program of study consisted of many subjects and politics was first: Whom did the revolutions first-aid men and nurses serve? To which social classes did they render service? The answer was that they served the workers and farmers because they belonged to the poor class. Under the feudal regime, only the rich could receive medical treatment or send their children to school to get a medical doctors degree, and they, in turn, would only serve the rich for benefits. The revolutions medics received no salarybe they first-aid men, nurses, assistant physicians or physiciansthey were to serve the people with the smallest cost to them. They were to alleviate the peoples suffering caused by disease. This was our political training. Of course, our political training was longer and what I just told you was only part of it. "After political training, we studied physiology, internal and external medicine, pharmacology, hygiene, Oriental medicine, obstetrics and pediatrics. Each of these subjects lasted for over 10 days. The most important subject in the program was external medicine because of the needs of the battlefield. We were told that we were being trained to become troops nurses wherever they went, and could be considered fighters.... Professionally speaking, my knowledge in external/internal medicine allowed me to treat bleeding wounds and broken arteries, either with medicine or by applying bandages. As for pharmacology and physiology, we studied just the main points, and after we left school, we were given some materials for further study." Ten medical textbooks in the collections of the Otis Historical Archives of the National Museum of Health and Medicine illustrate the improvisational nature of VC medical education. Only two of the books were published in Hanoi. One, a diagnostic textbook written by A.L. Miasnilov and translated into Vietnamese, features illustrations of rather Victorian-looking instruments. The other is a guide to medicinal plants. One textbook, titled Tai Lieu YSy Trung Cap Ben Hoc Noi Ngoi Khoa, is a collection of mimeographed typewritten lecture notes. Its print quality was bad enough to force a student to enhance the words with his own pen; in a moment of boredom, he also drew female features on a couple of the illustrations. Despite the poor quality of the printing, it was a comprehensive book that included sections on orthopedics, diagnostic techniques, infectious diseases, anesthesia both epidural and inhaled, DNA and RNA, and the treatment of bowel obstruction, hemorrhage, pneumonia, cholera and bronchitis. The remaining "books" consisted of bound handwritten lecture notes. Each such book reflected the personality of the student who took the notes. One has fancy lettering for each chapter, and another features a cartoon comparing the United States to a British imperialist lion. These books, which date from 1964 and 1965, include such topics as pharmacology, renal insufficiency, neurological disorders, sanitation, bandaging, administering injections, abdominal surgery, reproduction, cellular biology, orthopedics and the treatment of diseases such as cholera, malaria, ben-ben, anemia and cirrhosis of the liver. These textbooks show that despite the limited resources, the VC tried to give their medical personnel a comprehensive medical education. As the VC built up a cadre of medical personnel, it also developed an infrastructure for taking care of the wounded. A network of hospitals and supply trails allowed for the removal of the seriously wounded to the rear for better quality treatment. 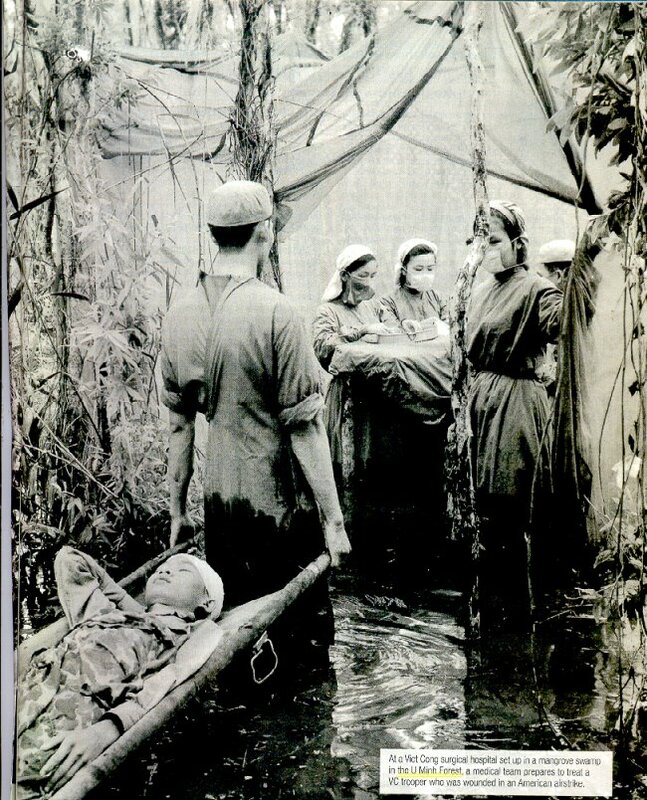 Dr. Ky, a VC doctor, described the system to a journalist in 1964: "Any casualty cart count on first-aid treatment at a company rnedical station within 30 minutes of being wounded; within one hour, he receives first surgical attention at the battalion level, and within two hours, fundamental surgery at regimental level. Only exceptionally serious cases have to be sent back to the main hospital; normally front-line hospitals can handle everything that comes their way. If the scene of action is not more than one or two days away from the base hospital, then serious cases will be sent back there. , . .The ~hospitalI can handle serious surgical cases and patients can be hospitalized there for weeks on end, if necessary." According to an assistant physician who previously had served as a first-aid man and then as a nurse, the first line of medical care was the first-aid man assigned to each squad. These people were trained to read prescriptions, administer medications and give injections. Each company had either a nurse or an assistant physician to apply bandages, give injections, distribute medicine and look after sick soldiers. While nurses were allowed to use a stethoscope and give medical consultation, they could only supervise the treatment of a patient when they were able to provide a definitive diagnosis. Nurses in the combat zone of South Vietnam were given more duties than those in North Vietnam, who performed in a more traditional role. A dispensary, or forward aid station, was frequently located in underground tunnel bases near the front and usually could accommodate 30 patients. Facilities typically included an operating room that was lined with parachute nylon to keep the dirt out of the surgical theater. These hospitals were run by an assistant physician, who was responsible for the health of a battalion. He or she was able to supervise the treatment of a patient and, if necessary, perform surgery. In addition to having more comprehensive training than nurses, assistant physicians, especially those stationed at the better-equipped regimental or district hospitals, had more resources to help make a diagnosis, such as stethoscopes, thermometers, sphygmomanometers, otoscopes and ophthalmoscopes. Seriously wounded patients were sent to regimental or district hospitals farther to the rear. Since medical doctors were fairly rare, they tended to be stationed at such hospitals. In addition to the surgical facilities found in a dispensary, these hospitals maintained rudimentary diagnostic laboratories that could do blood cell counts and urinalyses. At least one district hospital had an ray machine. A cook gave this description of one such facility near the Cambodian border: "Inside the hospital there were operating rooms underground. There were doctors, military medics, male and female nurses. There was also a first-aid room, There was plenty of medicine there for cadres coming from the North, who often stayed there for convalescence or for treatment... .The hospital was built on a piece of land about one acre large. Under the hospital were underground tunnels. On the ground were some long houses which were covered with canvas. The entire hospital was in the bamboo forest. The bamboo trees there were particularly dense, thus allowing no possible observation from the air. According to the patients who had been there, the underground tunnels there had been built on a very big scale, two meters deep, from 20 to 25 meters long and about 15 meters wide. Inside the tunnels, one could even hang hammocks." According to the cook, there were 200 patients at the hospital. Soldiers who had been permanently disabled presented problems for the VC. North Vietnamese soldiers were returned to convalescent camps in North Vietnam or to their hometowns. Among South Vietnamese soldiers, only those from "liberated areas" could be returned to their home villages; others had to be left under the care of Communist sympathizers. According to one private, platoon leaders and higher-ranking cadres were sent to the North, while low-ranking cadres and soldiers were left in the South. The lack of modem technology and the intensity of war hampered the VCs ability to handle the wounded according to plan. In the heat of battle, forward aid stations were frequently swamped. That meant patients had to be carried in litters from the battlefield to the hospital, a trip that could take several hours, and many died before receiving medical care. "Comrade Thieus leg was injured by shell fragments," stated one after-action report, and "blood flowed from his artery, so we tied a tourniquet around his leg and sent him to Cu Chi military hospital (CS) for treatment... .They refused to admit him. He was then sent to C3, which was crowded with wounded from the Cay Trac Battle. He was later evacuated to the Public Health Unit, which did not accept him either. Finally, he was sent back to CS. Due to the length of time prior to his treatment, his leg was amputated. In C3, many medical officers and medics refused to examine his case, in order to avoid facing problems. Comrade Thieu was so angry that he burst out with the following words: I would rather die than be evacuated from [one] place to another. I hope that you shoot me and finish my life. The amputation of Comrade Thieus leg was due to the fact that his leg had been constricted by a tourniquet for more than 10 hours." In addition to the wounded, assistant physicians had to deal with upper echelon leaders appointed more for their politics than for management ability or common sense. One dispensary director recalled being asked to transmit orders to "intensively cure the patients in a very short period of time, because of the limited quantity of medicines, the demands of urgent assignments and the need to restrict expenses. Despite limited facilities, VC surgeons performed a variety of surgical procedures. The director of one 50-bed dispensary noted that during an eight-month period featuring very little combat, the dispensary treated seven or eight surgical cases, mostly shrapnel and bullet wounds. One soldier, who had been wounded six days earlier, had his leg amputated in a procedure that lasted an hour and a half because of infection. He later died from complications. During the same period, surgeons also performed two appendectomies that lasted approximately 30 minutes each. Without a lot of training or medical equipment, assistant physicians sometimes had to use their ingenuity to take care of patients. Dr. Le described one case: "I once operated on the skull of the second-in-command of the Tai My village platoon. He was wounded by a mortar fragment that penetrated 3 centimeters into his head. I thought at first it was a simple wound and let another doctor operate on him. But when the fragment was taken our, the doctor realized that it had cut through the vein that runs from front to back inside the skull, known as the sagittal sinus. Once perforated, it bleeds a lot, and if the bleeding isnt stopped, the patient will die in 5 to 10 minutes. The blood spurted out and could not be stopped. You cannot stop a hemorrhage inside the skull with a plug, as you can [in] a flesh wound. If you want to pinch or sew a vein inside the skull, you have to open the skull. When my colleague could nor stop the bleeding, he sent for me. "When I arrived, I stuck my little finger inside the wound to staunch the bleeding, then used a gouge pliers for cutting boneto gnaw away bone on both sides and expose the vein to tie it up. We had to operate quickly. The enemy was all around us and we had to finish by 4 in the morning to move the patient to a safe hiding place. The vein turned out to be broken, and it was impossible to pinch it closed. Left as it was, the patient would have died. I thought of a new idea. I twisted a long piece of gauze into a plug and soaked it in thrombin Roussel, a solution that stops hemorrhage, and pressed it onto the vein temporarily to stop the bleeding. Then we carried the patient away and hid him. We put up his hammock in the middle of an open field and concealed him in the grass; we hid in the tunnels. "The enemy attacked the area that morning. That evening, I operated on him a second time. In the end, I could nor find a way of tying up the vein. I changed the plug, again soaking it in thrombin Roussel to stop bleeding temporarily. Then we took the patient to the tunnel hospital CS at Ho Bo to be cared for there. I suggested that he be taken to the big hospital in COSVN area, where a specialist could see him, but there was so much enemy activity in the Ho Bo area that it was impossible to move him. I had left instructions for the plug to be changed after 15 days, and the procedure to be repeated if the bleeding returned. Twenty days later, I went back to CS and was surprised to learn that he was leaving the hospital. I was told that when the plug was removed, the vein had not bled, [and that] the patient was well and was returning to his unit." Pain management was not very sophisticated. Anesthesia was used, but its quality and quantity were limited. One dispensary had ethyl ethet in stock, but had no doctor properly trained in its use. Thiopental sodium was the general anesthesia of choice. Frequently, surgeons administered local anesthesia such as Novocain by injection. Analgesics such as morphine were very rare, and most patients were treated with aspirin and sodium salicylate. A dispensary director (who was also a political officer) once asked amputees if they were in a lot of pain, and noted that "they said it wasnt too bad." Trauma surgery requires blood transfusion. Since hospitals rarely had generators or refrigerators, there was no means to maintain a blood banking system; however, blood transfusions were performed. Blood collected from others was placed in sterilized bottles for immediate transfusion into patients. Occasionally, blood collected from the patient was transfused back into his veins. Dr. Le described the process: "We managed to do blood transfusion by returning his own blood to the patient. For example, if a comrade had a belly wound and was bleeding, but his intestines were not punctured, we collected his blood, filtered it, put it in a bottle and returned it to his arteries; at the front we did blood transfusions like that. All our medical staff had their blood groups checked. And we analyzed the blood of [whoever was brought to us. If I happened to have the blood group, I gave him my blood." In 1958 the government of Vietnam listed malaria, tuberculosis and intestinal disease as the leading causes of death. While government officials, in cooperation with the World Health Organization, had made some headway in fighting malaria, the rising insurgency had undermined the program by 1965, and these diseases remained a threat to American, ARVN and VC troops throughout the Vietnam War. Although the VC provided a wide variety of medications to their assistant physicians, the director of a dispensary summed up the medicine supply situation as follows: "We had enough kinds of medicines, but the quantity was small. The main ones were anti-malarial medicines and antibiotics such as penicillin and strepromycin." Malaria was a major problem for the VC, and the availability of antimalarial medications varied from unit to unit. One lieutenant reported that when his unit arrived in South Vietnam in March 1967, at the beginning of the wet season when the incidence of malaria was increasing, none of the troops were sick because they took their medicine at the first sign of illness, and those who came down with malaria were immediately sent to the hospital. A private in another unit noted that there werent any antimalarials available and approximately three-quarters of his unit was sick with malaria. Intestinal diseases are traditionally the scourge of armies. Primitive waste disposal, poor personal hygiene, the abundance of flies and the heavy rains that washed feces-laden soil into the water supply during the rainy season ensured that diartheal diseases afflicted all armies in South Vietnam. Not surprisingly, antibiotics were the most common class of pharmaceuticals captured during the war. While tuberculosis was a major public health problem in South Vietnam, afflicting 10 to 20 percent of the population, very few of the captured VC personnel mentioned it as a medical problem.Malnutrition was another common problem among the troops, since a balanced diet was hard to maintain in the field. VC doctors were well aware of how poor nutrition hampered a patients recovery. Convalescents were supposed to receive more food than the typical soldier, and their diet was often supplemented with vitamins. One assistant physician described their use: "When a member had a headache, stomachache or felt tired, he was given aspirin, anti-grippe, pyramidon or oprhalidon,.,.The name of the medicine was noted down and the first-aid man was responsible for looking after the patient to find Out if he got better or worse. If the patients condition remained the same, the first-aid man would give him injections of vitamins C, B-1 or B- 12." The VC medics were very proud of their use of traditional Vietnamese pharmaceuticals. By studying traditional medicine using the scientific method, they hoped to create a distinctively Vietnamese Socialist pharmacopeia, integrating the traditional with Western medicine. In addition to their nationalistic appeal, medicinal plants had the advantage of being readily available. However, their efficacy was suspect, as one VC defector noted: "The medical care was quite inadequate because we didnt have enough drugs. We had to send messages through several channels to have drugs purchased in Saigon. The drugs would take months to reach us, and sometimes we received none at all. As we ran out of Western medicine, we had to resort to Oriental herbs. Our patients often got worse." In 1966, one VC corpsman described his training in Oriental medicine and named 59 ingredients used to create nine medicinal compounds. They were used to treat such diseases as sunstroke, malaria, dysentery, cholera, tapeworms, inflammation of the liver and tuberculosis. The corpsman claimed that one compound for the treatment of heart attacks was 80 percent effective. Although many of the ingredients had been studied and found effective in the West, the corpsman noted that these compounds were used in combination with Western medicines when available, and only Western medicine was considered effective in severe cases of malaria. The traditional Vietnamese pharmacopeia served to validate traditional culture as well as provide a source of pharmaceuticals. Communist propaganda made much of how Western imperialists had suppressed traditional medical practice in Vietnam. However, since Marxism accepted and was based on "scientific" principles, Western science was not rejected out of hand. The North devoted considerable resources to conducting clinical research into the efficacy of traditional medicines. The medical materiel used by the VC came from a wide variety of sources. Of the medicines and instruments analyzed by U.S. Army Military Intelligence, 59 percent originated in non-Communist countries such as South Vietnam, France and the United States, and 19 percent came from the Communist bloc. The source of the remaining 22 percent could not be positively identified, but most were believed to have been manufactured by the VC. Most of the medical supplies and equipment came through North Vietnam and were sent to South Vietnam via the Ho Chi Minh Trail. The supplies sent by this route were manufactured by a variety of sources, mainly North Vietnam, the Peoples Republic of China and the Soviet Union. North Vietnam s trade with Sino-Soviet bloc countries accounted for 82 percent of its imports in 1963, and the remaining 18 percent of trade was with non-Communist countiesalmost a mirror image of the proportions of the medical supplies captured by the Americans. Much of this trade was for food, raw materials and manufactured goods. Frec~uently, medical supplies and pharmaceuticals were provided to North Vietnam as humanitarian assistance, notably by East Germany, Poland, the Netherlands and neutral countries such as Sweden and Switzerland. Viet Cong propaganda devoted much attention to the surgical instruments and medicines produced at the hospitals. Wilford Burchert, a Marxist journalist, described his conversation with Dr. Ho Thu: "He astonished me by saying that the Front now produces 70 percent of its medical requirements. This had been possible, he said, because we made a careful study of traditional Oriental medicine and based ourselves on the great wealth of our forest products.... It was only when we made a proper inventory of the local vegetable, animal and forest products and checked these off against ancient Oriental medical manuals, that we realized how rich we were." Dr. Thu claimed to have discovered an herbal cure for gangrene and a serum protein to replace plasma. manufactured in South Vietnam by the VC. Still, that was an impressive achievement considering the facilities available. Some of the district hospitals produced or repackaged pharmaceuticals such as quinine, Novocain, camphorsulfonate, Adrenalin and vitamins. Surgical instruments were manufactured from scrap aluminum. While these low-cost instruments were only a small percentage of those used by the VC, they supplemented the better-quality instruments provided by the Communist Chinese. This extensive production of pharmaceuticals and instruments was meant to legitimize the revolution by showing that it operated without North Vietnamese support and was, therefore, a spontaneous uprising by the oppressed South Vietnamese people rather than subversion from the North. The third source for medical supplies was South Vietnams infamous black market. Prescription drugs could easily be purchased in Saigon drugstores. In 1965, a 250mg Tetracycline tablet could be purchased without a prescription for 28 piasters, or about 23 cents. Approximately 40 percent of the medical materiel analyzed by Military Intelligence originated from the United States or South Vietnam. One document listed 45 South Vietnamese pharmacies whose medicines had been found in VC hospitals. Ho Chi Minh described the Communists~ willingness to accept heavy casualties, saying, "In the end, the Americans will have killed 10 of us for every American soldier who died, but they will tire first." Despite their costly tactics, the VC went to a great deal of trouble to take care of their sick and wounded. There are a number of reasons for the considerable effort that went into creating a medical department. A major one undoubtedly was concern for the welfare of their troops, since many Vietnamese had, through Marxist ideology, accepted Western concepts of the value of the individual, and they wanted to provide the best possible medical care for their sick and wounded soldiers. However, it is clear from VC propaganda that the goal of health care was as much to justify the revolution as it was to take care of the wounded. It was used to illustrate the type of society they intended to create. By providing medical care to the soldiers, as well as to the villagers in "liberated zones," they wanted to show that their revolution was an egalitarian one that cared for everyones basic needs regardless of class, in contrast to a "feudalistic" South Vietnam, where medical care was available only to the wealthy. to inspire cynicism when they couldnt be met. The sight of wounded soldiers limping northward on the Ho Chi Minh Trail was sobering to the fresh troops marching southward, and ultimately inspired one VC captain to defect. Shortages were also the source of much cynicism. "The patients often complained about the inadequate medical care they received," recalled one Local Forces member. "The nurses had to comfort the patients by spending all of their time by the sick beds explaining to the men that because we were at war, drugs were hard to get and the men just had to be brave and put up with the little they had. Although the nurses and the cadres tried hard, the men were still dissatisfied. They said, We spend our lives working for the revolution, yet when we fall sick there arent any drugs for us. We dont want to rot in this place. Many of them left to go home where they hoped to get help." Despite some dissatisfaction, VC doctors earned the respect of both their own soldiers and their opponents. While the instruments and pharmaceuticals captured from the battlefields are a reminder of their remarkable efforts to take care of their sick and wounded soldiers, perhaps what is more significant is what was not found. They lacked X-ray machines, intravenous fluids, equipment for banking blood or means of rapidly removing wounded from the battlefield, items that could have tipped the odds in favor of VC surgeons as they fought to save casualties. Although the captured medical equipment testifies to the efforts made by the VC on behalf of their wounded, in the absence of definitive information it is difficult to evaluate their effectiveness. But it is hard not to be impressed by their efforts at developing a modern military medical department under extraordinarily difficult and primitive conditions. In 1966, Captain Arthur Ahearn, a surgeon with the 5th Special Forces Group in Vietnam, concluded an article on VC medicine by saying, .... . the tendency to downgrade the extent and effectiveness of the VC medical operation should be avoided. Although it is true that in many aspects VC medicine is at a level parallel with American medicine during our civil war, it is believed that if the full truth were known, all would be amazed at the quality of medical care they are able to give their sick and wounded." Alan Hawk is the collections manager of the Historical Collections of the National Museum of Health and Medicine. He also served in the 1-115th Infantry, Maryland Army National Guard. For additional reading, see PAVN: Peoples Army of Vietnam, by Tuyen Haun; arid The Tunnels of Cu Chi, by Tom Mangold and John Penycate. About - The Human Internet: Read about other medical issues related to the Vietnam War at miliraryhistory.about.com/vietnam.